The name 'Woodroffe', also seen as 'Woodrow', derives from the Old English "Wudu +(ge)refa", meaning 'wood reeve'. A 'reeve' in England was an official of a court, town or a village, and so a 'wood reeve' was therefore a person responsible for a piece of woodland, a head forester or forest warden. Joseph was Calum's and Jamie's great great great great great grandfather. Joseph was born at some stage towards the end of the Eighteenth Century, but it is not yet known where and when, although it may have been in Stirlingshire, Scotland. From his daughter Joan's wedding entry in the OPR in 1834, Joseph was described as "the late Joseph Woodriff, gardener in Stirling". If accurate, this must describes Joseph's work before he enlisted in the army, at some stage before 1799. It cannot be a description of his life after the army - as will plainly be seen...! Alternatively, the first military record to mention Joseph is in the year 1799, and it lists him as having completed a march from Hull, in Yorkshire. This may also be a place of origin for him. Joseph was a soldier who started his career in the Second Battalion of the 15th Regiment of Foot, otherwise known as the Duke of York's Own. The records from the regiment are held at the Public Records Office in Kew, London. The Second Battalion was formed in 1799, and the earliest surviving record of the regiment is a muster roll held in the Public Records Office in Kew, London, for the end of November 1799. Unfortunately, this roll already has Joseph listed as a member of the battalion - the key information on his enlistment to the battalion in an earlier muster roll no longer seems to exist, which means I cannot find a place of enlistment for him, and hence I have no idea whether he was from Yorkshire, Scotland, or wherever. Between 25th November and 24th December 1799, Private Joseph Woodroof (sic) is listed as being a member of Captain Ainsworth's company. He is described as having just completed a march from Hull to Sunderland in England in this period, and was paid a sum of £1, 10 shillings, 9 1/3 pence (PRO: WO 12/3294). On Christmas Day, 1799, Joseph was promoted to corporal in Sunderland, and transferred to Captain James Robinson's Light Infantry company. His new salary was £1, 16 shillings, and 9 and 3/4 pence, of which 30 pence was in lieu of beer. Rather oddly, Joseph is listed as "Corporal Thos. Woodridge", but this is almost certainly him - no Private Joseph Woodroof is listed, and the promotion to corporal is confirmed when he reappears under his proper name on 25th February 1800 as "Cpl. Jos. Woodroof". The person transcribing the names of the soldiers obviously made a mistake. 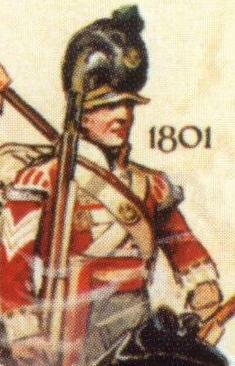 In January 1800, Joseph was sent to Ireland with his regiment, initially to Athlone, and then on to Dublin, where his unit was based until March 1802. His arrival took place only a year after the United Irishmen rebellion, and more significantly, in the month in which Ireland formally became part of the United Kingdom of Great Britain and Ireland. Between September 1st 1800 and November 30th 1800, Joseph is listed as having been sick in the Royal Infirmary in Dublin, but no indication is given as to what the illness was that he was suffering from. He recovered by November 1800, and three months later, in February, he is listed in the adjutant's book as being in England, attempting to secure new recuits with his fellow corporals, in an area called Marke, whilst the majority of the regiment remained behind in Dublin. He was in England for two months, but by April 1801 he is listed as being back in Dublin. It appear that in May or June 1801, Joseph's captain, James Robinson, died. He was temporarily replaced by Captain Jonathan Gilbert, but in July 1801, we learn that Joseph was by now serving under Captain George Noble in the Light Infantry. From 25th October 1801 to 19th December 1801, Joseph is listed as being on "furlough", ie leave. Upon his return to duty, he remained with the regiment until March 31st 1802, where we discover he was discharged, and that he subsequently volunteered to join the 26th Regiment of Foot. In April, Joseph made his way to Plymouth Dock, in Devonshire, England, where he joined the First Battalion of the 26th Regiment of Foot, which had just returned from Egypt, where it had battled the French and Italians and won. Joseph initially served as a private in Captain Chris Davidson's company, earning a monthly salary of £1 and 11 shillings, the first record of his membership being the adjutant's roll from 25th May 1802 to 24th June 1802, where he is listed as "Private Joseph Woodroffe". On 15th August 1802, Joseph was promoted back to the rank of corporal and transferred to the company of Captain William Garstin. The regiment remained in Plymouth until November 1st, when it then set sail for Scotland aboard two frigates, arriving at Leith on the 13th. From there Joseph marched to Stirling Castle. Joseph remained at Stirling until Christmas 1802, after which he is next found stationed at Kirkcaldy in Fife on 24th January 1803, where we learn he was "com at Kirkcaldy", the majority of the regiment remaining at Stirling until February 1803. At the beginning of February Joseph's company went on a 21 day march to Fort George, near Inverness, in search of new recruits, but ended up back at Kirkcaldy by the 24th, with few Scottish additions, the number of the regiment being mainly swelled by Irish recruits. It seems that Janet came from Port of Menteith (formerly in Perthshire, but now in Stirlingshire), where she may have been living prior to the wedding, and where she certainly was based after it. Her honeymoon period with her new husband was short, as in December Joseph was again posted to Ireland, along with the 26th. His battalion marched to Portpatrick and embarked for Donaghadee, and from there marched to Armagh. On 26th April 1804, Joseph was promoted back to the rank of corporal and transferred to the company of Capt. Gifford. Although it is not known when Joseph's and Janet's first child, Joan, was born, it seems likely that it was in mid-1804. In later years, Joan described her birthplace as being Port of Menteith, but there is no record of a Joan Woodroffe born in the parish. It seems possible that Joan was in fact born in Ireland, and that Janet may have accompanied Joseph to Ireland, but there is no proof of this. In mid-June 1804, Joseph's new company was sent on a march to Ballinasloe in Dublin, and then on to the Curragh, which was reached in July, where his company took part in military manouevres under Lord Cathcart, the Commander-in-Chief in Ireland. And on 6th August 1804, Joseph was again promoted, this time to the NCO rank of sergeant, taking his monthly salary up to £2, 8 shillings, 5 and a quarter pence. Between 7th August and 24th August 1804, Joseph served temporarily under Captain Sir James Dalyell, but on 25th August he joined the company of Captain William Walker and posted to Ballinasloe in Dublin, where he is listed as "on command" in the adjutant's book. The company's captain changed in late October 1804 to William Fotheringham, and again in late April 1805, to Captain Patrick N. Savage. In June the company again had a change at the helm, being taken over by Captain A.W.Wainhouse. In July 1805, the company was mustered at Athlone, and then after a brief stay at the Curragh again, Joseph was on command at Bandon in Cork. Captain McLEOD, of his Majesty's sloop Cygnet, on Monday, the 16th inst. off the Goodwin Sands, picked up several chests, belonging to Officers of the 26th regiment of foot, and saw beams and different parts of the Aurora transport, which had sailed with the Commanding Officer, Staff, and about 250 men of the 26th regiment of foot. Major DAVIDSON, Capt. HOGGINS & CAMERON, Lieutenant BROWNE, Ensign DALYELL, Quarter-Master CAMPBELL, Quarter-Master ROBERTSON, Lieut. & Adjutant HOPKINS, Surgeon DEVAL. Great fears are entertained for the Maria transport, with about 200 men of the 26th foot on board; a vessel exactly answering her description was seen dismasted off the Texel - it is hoped that she may have got safe into some Dutch port. The Officers on board her were, Captains GARDIN and JONES; Lieutenants CAMPBELL and MARSHMAN; Ensigns CUNNINGHAM and MATHESON; and Assistant Surgeon ARMSTRONG. The Aurora, we fear, is certainly gone; but some faint hopes are entertained that the Maria may yet be safe. The remainder of the 26th foot are safe in the Downs. Joseph died on 29th December 1805. A late entry for December's adjutant's book records that he "died 29th - instant Boherholtz", whilst the entry for January 1806 says he "died 29th Dec 1805 4 ship station", the muster being recorded as being taken at Bohrholtz. The remnants of the regiment were mustered at Bohrholtz on January 1st 1806, and so it is not known whether Joseph died aboard ship or after having landed, although on board ship is the most likely point. Ironically, and quite tragically, the regiment was pulled out of theatre only six weeks later, as European alliances suddenly changed and British priorities responded likewise. The whole expedition turned out to have been unnecessary, and the cost was devastating. It is known though that prior to his departure for the Continent, Joseph had one final meeting with his wife Janet - for in July 1806, Janet gave birth in Port of Menteith to their son, Joseph, obviously named in honour of his dead father. Joan was Calum's and Jamie's great great great great grandmother - see below. b: 19/7/1806 c: 26/7/1806 (GROS: 388/1/fr238) d: 18?? Joseph, son to Joseph Woodriff late sergeant in the army and Jennet Peterson a native of this parish born 19th baptised 26th July. Joan was Calum's and Jamie's great great great great grandmother. Joan was born in approximately 1804/1805 in the Port of Menteith, Perthshire. A search of the OPR records for the parish has failed to turn up notice of this, but in the census entries from 1851 to 1871, Joan lists her birthplace as Port of Menteith. In the 1851 census her age is listed as 44, which would place her birth year at 1806 or 1807. This is clearly innaccurate, as her father died in December 1805. As Joan's parents were married in 1803, this leaves the intervening years as the range for her birth date. Being orphaned at such an early age, Joan was raised by her mother initially in their home village of Port of Menteith. In the wedding certificates of two of Joan's children, William Hay Paton and Helen Fenwick, she is twice recorded as being Joan Fenwick, previously Paton, formerly Thomson, m.s. Woodroff. The "formerly Thomson" bit is of interest, as no listing has as yet been found for a wedding between Joan Woodroffe and anyone of the name Thomson. William Paton, plasterer, residing in No.1 Leslie Place, Stockbridge, and Ann Woodroff, residing in No.28 Gilmore Place, both in this parish, daughter of the late Joseph Woodroff, gardener in Stirling, have been three times proclaimed in order to marriage in the parish of St Cuthbert's and no objections have been offered. Married on the fourth day of November thereafter by the Reverend David Marr, Minister of the United Associate Secession Congregation, Lothian Road. Soon after the wedding, Joan and William moved to Perth, moving in with William's father at the family home of Carscroft, where they went on to have three children - Joan, William and Janet. Although William was a plasterer by trade, Joan undoubtedly worked in the cottage as a pirn winder, helping her father in law with his weaving duties, as well as raising her own children. However, there were soon to be tragic changes in the family. On January 10th 1836, Joan's eldest daughter Joan, known more colloquially like herself as 'Ann', died from wooping cough in the cottage at Carscroft. And less than two years later, on November 6th 1838, Joan's husband William died from consumpsion, or tuberculosis, leaving her a widow. After the death, Joan struck up a relationship with a gentleman called Stewart Fenwick, the warper son of a local weaver Gilbert Fenwick, and his wife Janet Stewart. Perth the Thirteenth day of July One Thousand Eight Hundred and Thirty Nine years_____contracted Stewart Fenwick Warper in the East Church Parish of Perth daughter of the late Joseph Woodrooff, Sergeant 26th Regiment of foot_____Elder Robert Grimmond_____The Persons before named were regularly proclaimed and Married the Twenty ninth day of July said year by the Reverend David Young Min of the United Association Congregation in Perth. Stewart became the stepfather of Joan's children, William and Janet, who moved in with him alongside their mother. Within a couple of years, Stewart and Joan had their own child together, whom they named Stewart. Stewart was soon joined by Gilbert, Helen, Joseph and Ann. The couple lived initially in the East Church parish, but between 1851 and 1878 Joan lived in the West Church parish of Perth, in a variety of addresses on Pomarium Street. In the 1851 census the family is simply listed as living on Pomarium. Stewart was described as a 56 year old warper, whilst Joan, listed as Johann, was described as a 44 year old winder, i.e. a pirn winder. Joan's son William was an unmarried 16 year old apprentice currier, whilst her daughter Janet was also a winder, aged 14. Stewart and Gilbert were described as scholars, aged 10 and 8 respectively. Also present in the house were 6 year old Helen, 3 year old Joseph and 1 year old Ann (Cen:1851/387/00/1/25). By 1861 we learn that Joan and Stewart were at 4 Pomarium Street, with Stewart listed as a 66 year old "warper of cotton webs", and Joan listed as 54 year old Johan Fenwick, born in Port of Menteith. Also present were 20 year old son Stewart, a currier, 18 year old Gilbert, now a dyer, 16 year old Helen, now a "worker in an ink manufactory", 13 year old Joseph, a lensmith, 11 year old Ann, a scholar, and Joan's 24 year old daughter Jessie B. Paton, listed as a "minder of cotton yarns" (Cen:1861/387/29/1). DIED - At 4 Pomarium Street, Perth, on the 13th instant. STEWART FENWICK aged 71. Friends at a distance will please accept this intimation. After spending some time at number 10 Pomarium Street, Joan again moved to number 7, where she spent the remainder of her days. She died on August 9th 1878 at the infirmary in Perth, aged 72. The cause of death was disease of the heart, as certified by Dr William Gillespie. Her son Gilbert informed the Perth registrar the following day. Carscroft West Church Parish Perth the Tewnty first day of February Eighteen hundred and Thirty Three was born Joan Woodrooff Paton lawful daughter to William Paton in said parish and Joan Woodrooff his spouse and baptized the tenth day of March said year by the Reverend James Esdaile Minr of the East Church Parish of Perth. Calum's and Jamie's great great great grandfather. Carscroft, Monday the tenth day of March One Thousand Eight Hundred and Six was born William Patton, lawful son to William Patton, weaver in Carscrfot, and Christian Hay his spouse and baptised the Sixteenth day of March said year by the Reverend Mr.James Hewison Moody, Minister of the Gospel in Perth. Carscroft West Church Parish Perth the Ninth day of July one thousand eight hundred thirty six was born Janet Brown Paton lawful daughter to William Paton plasterer in the said parish and Ann Woodroffe his spouse and baptized the Seventeenth day of July said year by the Reverend William Mather Minister of the Gospel at Stanley. Janet was listed in the 1851 census as a 14 year old winder, living at Pomarium Street with her mother Joan Woodroffe and her stepfather Stewart Fenwick (Cen:1851/387/00/1/25). She was again with the family in 4 Pomarium Street in 1861, where she was listed as 24 year old Jessie B. Paton, "minder of cotton yarns" (Cen:1861/387/29/1). It is not yet known what became of Janet after this. In the 1851 census Stewart was listed as a scholar (Cen:1851/387/F/1/25). In 1861 he was an apprentice currier (Cen:1861/387/1/29/1), and by 1865 we learn from his father's death cert that he was living in Aberdeen, probably where he was doing his apprenticeship. On June 11th 1869 Stewart married 28 year old seamstress Agnes Pearson, daughter of jeweller James Pearson (deceased) and Agnes Murie. The ceremony took place at 3 Prospect Terrace, Ferryhill, in the district of Old Machar, Aberdeen, with the marriage performed according to the rites of the United Presbyterian Church. At the time of the wedding Agnes was living at 3 Charlotte Street, Aberdeen, whilst Stewart was living at 1 Charlotte Street. The minister was the Reverend Matthew Galbraith, and the witnesses George Duncan and Elisa Wark, and the marriage was registered in OLd Machar on the 14th. Of particular interest in the wedding entry is the fact that Agnes' mother is recorded as Joan Fenwick, previously Paton, formerly Thomson, m.s Woodroff, which confirms a similar entry recorded for Helen's brother William Hay Paton at his wedding (GROS:1869/168/02/132). Stewart and Agnes then moved to Dundee and started a family. Stewart worked as a currier initially, and then as a cotton warper. By 1881 he was a currier again, living with his wife and family at 249 Hawkhill, Dundee. His children, Stewart aged 11, Joseph aged 9, and James aged 7, were all listed as scholars. Also in the house were baby Agnes, just one month old, and four year old Elizabeth, as well as a housekeeper, 36 year old Margaret Cree, originally from Inverness, and listed as a visitor (GROS:282/1/28/3). In 1901 Stewart lived with his family at 17 Louf Wynd, Dundee (GROS:1901/282/2/4/6). He remained a currier until his death. Stewart died August 13th at 00.45am, whilst living at 21 West Mary Street in Arbroath, aged 71. The cause was a cerebral thrombosis, which he has suffered for six months. His daughter Agnes registered the death at Arbroath the following day (GROS:1913/272/1/250). Stewart was born on 11/3/1870 (GROS: 1870/282/4/353). He is recorded in the 1901 census at his father's address, working as a commercial traveller (GROS: 1901/282/2/4 p.6). On June 22nd 1903, Stewart married Euphemia McEwan McRither, daughter of John McRither and Christina Buchan. The wedding took place at Mathers Hotel in Dundee, after banns according to the forms of the established Church of Scotland. At the time of the wedding, Stewart was living at 13 William Street, Forebank, Dundee, whilst Euphemia was living at 28 Peddie Street. The witnesses to the marriage were William Robertson McRither and Agnes Marie Fenwick, and the wedding was registered on the following day in Dundee (GROS:1903/282/2/167). In the 1929/30 Burns and Harris Dundee Directory, Stewart is listed as a "represent (Middleton, Aberdeen)" and as residing at 51 Blackness Avenue. Stewart died at the Victoria Hospital in Dundee on November 11th 1940 at the age of 72. At the time he was noted as still living at 51 Blackness Avenue. The cause of his death was cerebral haemorrhage, as certified by Dr W.E.Foggie. The informant to the Dundee registrar was his son Norman, on the 12th (GROS: 1942/282/4/210). 1901 census: Joseph became a jute mill mechanic in Dundee (GROS: 1901/282/2/4 p.6). He went on to marry Janet Hall Robinson, and then to become the manager of a jute mill in Dundee, a position he held until his retirement. In the 1929/30 Burns and Harris Dundee Directory, Joseph is noted as a machine fitter residing at 13 St. Peter Street in the city. Joseph died at 2.00pm on April 13th 1952 at the Royal Infirmary in Dundee. His usual address was listed as 351 Arbroath Road in Dundee. The cause of the death was myocardial degeneration, as certified by Dr. J Rankine. The informant to the registrar was Cecily Havard on the 19th (GROS:1952/282/02/421). 1901 census: James was a weaver initially, but became a stonemason(GROS: 1901/282/2/4 p.6). 1901 census: recorded as staying at home to work with her mother (GROS: 1901/282/2/4 p.6). Agnes died in infancy at the age of one year old, in her home of 249 Hawkhill, Dundee, in the parish of St Peter's. The cause was dentition and measles, and there was no medical attendant present. The informant to the registrar was her father Stewart, on the same day (GROS:1880/282/1/47). Agnes was named after her deceased sister, who had passed away in infancy in the previous year. She was born at 3.00am on March 30th 1881, at her home of 249 Hawkhill, Dundee. The informant to the registrar was her father, Stewart, two weeks later on April 18th (GROS:1881/282/1/277). In the 1901 census, Agnes is listed as working as a leather machinist (GROS: 1901/282/2/4 p.6). She went on to marry a salesman collector called James Guthrie Smith, and had at least one son, G. Smith, of whom more has still to be found out. Agnes died on August 13th 1940 at 11.40am, at her home of 340 Strathmore Avenue in Dundee. The cause was diabetes, from which she had suffered for at least five years, arterio sclerosis and hyperiosis, from which she had suffered three years, and a cerebral haemorrhage, as certified by Dr. George Henderson. The informant to the Dundee registrar on the following day was her widowed husband James (GROS:1940/282/02/612). James himself died in June 1946. He was last seen alive on June 4th at 10.30am in his home at 540 Strathmore Avenue in Dundee, but was found dead there on June 7th at half past midnight. The cause was probably myocarditis, from which he had suffered for 5 years, as certified by Dr George Henderson, although confirmation of this will not be known until I have checked the Register for Corrected Entries (Vol.XXIII p.83, 20/6/1946). The informant initially to the registrar on the 10th was his son G. Smith, who lived at 78 Peddie Street in Dundee (GROS:1946/28202/452). In his death entry, James was listed as a credit draper's collector (retired). 1901 census: George became a clerk (GROS:1901/282/2/4 p.6). Gilbert became a journeyman yarn dyer in Dundee, but his life was tragically curtailed at the age of 36. On January 14th 1880 his drowned body was found at 2.00pm floating in the River Tay, close to Dundee's High Street. MAN DROWNED - As two men in the service of the Harbour Trustees were rowing in a boat up the river, opposite the Caledon Shipbuilding Yard, they discovered the body of a man floating in the water. It was secured and landed at the Craig Pier, and carried into the Mortuary. The deceased appeared to be a working man, about thirty five years of age, and from its appearance the body has evidently been in the water but a very short time. Nothing was found on the body to lead to its identification, the only articles in the pockets being 1s 1d in silver and copper money, a pipe, a tobacco box, and a small piece of bread. The deceased has dark moustache and whiskers. The dress consists of a blue pilot jacket, dark trousers and vest, elastic-sided boots, blue stockings, a grey woollen shirt, and new plaiding drawers. THE LATE DROWNING CASE IN THE TAY - IDENTIFICATION OF THE BODY. - The body of the man which was found floating in the river near the Stannergate on Wednesday last was identified yesterday forenoon by Stewart Fenwick, currier, Havelock Place, as that of his brother, Gilbert, who was a dyer, and resided in High Street, Perth. The deceased, who was on a visit to his brother, left the house about ten o' clock on Wednesday forenoon to look for employment. He was 36 years of age, and unmarried, and had been in a desponding state of mind for some time. Yesterday the body which was found in the Tay on Wednesday last was identified by Stewart Fenwick, currier, Havelock Place, Dundee, as that of his brother Gilbert, who was a tailor, and resided in Perth. Deceased, who was 36 years of age and unmarried, left his brother's house in search of work on the morning on which he was found drowned. He had been in a desponding state of mind for some days. The man who was drowned in the river on Wednesday afternoon has been identified as Gilbert Fenwick, dyer, Perth. he had come to Dundee seeking employment, and after visiting his brother on Wednesday morning he had, it is supposed, in a desponding state of mind, gone down to the harbour and committed suicide by throwing himself into the river. He was 36 years of age and unmarried. The initial informant to the registrar was Gilbert's brother, Stewart. In his death register entry, Gilbert was noted as a yarn dyer (journeyman), single, and age 36. He was found in the River Tay about 2.00pm, and his usual residence was in High Street, Perth. His father was Stewart Fenwick, yarn warper (deceased), and his mother Joan Fenwick, previously Paton, formerly Thomson, maiden surname Woodroff (deceased). The cause of death was 'found drowned' and the informant his brother Stewart Fenwick, 249 Hawkhill, Dundee. (GROS D 1880/282/2/45). 14th January 1880 In River Tay about 700 yards east from the Messrs Thomson's Shipbuilding Yard at Dundee Harbour. The cause of death was 'drowning', and was 'not certified by a medical man'. Helen was born in Perth in 1845. On June 18th 1869, Helen married 29 year old journeyman blacksmith David Hallyburton, son of mason Adam Hallyburton (deceased) and Agnes Goodall. At the time of the wedding, Helen was a 24 year old bottle labeller, resident in Perth at 10 Pomarium, where the wedding took place, whilst David was resident at 219 High Street. The minister, who performed the marriage according to the rights of the Free Church of Scotland, was John Laidlaw, and the witnesses included Helen's sister Ann Fenwick (GROS:1869/387/00/93). In the 1881 census for Perth, 36 year old Helen is listed as living at 145 High Street, with her husband David, described as an engine fitter at a factory, her 30 year old sister, Annie Fenwick, unmarried and working as a seamstress, and her children, Adam, aged 10, Agnes aged 5, Joan aged 8, and Annie, aged 1. Also in the house were two boarders - 67 year old James Davidson, a form newspaper reporter, and 23 year old Isabella Davidson, employed in the dyeworks (GROS:387/32/12). Helen died of phthisis pulmonala at 8.30pm on September 15th 1888, basically the wasting away of lung tissue caused by tuberculosis. At the time she was living at 149 High Street, and her death was witnessed by her husband David, who informed the registrar two days later (GROS: 1888/387/0433). The widowed David was recorded in the 1891 census at 14 Caledonia Road, East Church, Perth. His occupation was listed as a blacksmith, and with him were recorded his daughters Joan (a linen weaver), Agnes, Annie and Helen, and his son David. (GROS:1891/387/8/p.22). Shortly after the census was taken, Joan died in Perth (GROS:1891/387/204). In the 1881 census, Adam was listed as a 10 year old scholar living with his family at 145 High Street, Perth (GROS:387/32/12). Adam grew up to become an apprentice iron fitter. His home residence was at 149 High Street, but he died at Hillside Home, a single man at the age of 18 on January 10th 1889, at 5.30 am. The cause was phthisis pulmonalis (tuberculosis), as certified by Dr David Stirling. His father registered the death on the same day. Joan was described in the 1881 census as an 8 year old scholar living at the family home of 145 High Street, Perth (GROS:387/32/12). Joan became a power loom weaver who lived at 10 Caledonian Road in Perth. She tragically died at the age of 19 on May 17th 1891 at 11.30am, of phthisis pulmonalis, better known as tuberculosis. Her father informed the registrar the following day (GROS: 1891/387/0/204). John died in infancy at the age of 1 on April 4th 1875, at 3.30pm. The cause was bonenulious (? ), which he had suffered for 2 days. His father registered the death on the following day. Agnes was described as a 5 year old daughter living at 145 High Street, Perth, in the 1881 census (GROS:387/32/12). Agnes married William Shaw, a railway inspector, on October 2nd 1896 at Perth (GROS: 1896/387/0/821). William predeceased Agnes, who died on April 15th 1938 at 0.15am, at 41 Scott Street in Perth, the cause being a cerebral haemorrhage, as certified by Dr. J.T Simpson. The informant to the registrar on the same date was her son William, who was living at 190 Crieff Road in Perth at the time, and who was present at her death (GROS: 1938/387/0/227). Agnes died on April 15th 1938 at 0.15am at 41 Scott Street, Perth. She was noted as the widow of William Shaw, Railway Inspector, and daughter of David Hallyburton, blacksmith, and Helen Fenwick, both deceased. The cause of death was a cerebral haemorrhage, as cert by J. T. Simpson. The informant was W. Shaw, son, 190 Crieff Road, Perth, on the 15th (GROS D 1938 387/00 0227). William was born at 24 Market Street in Perth, at 0.20pm, August 29th 1897. The birth was registered by his father on 6/98/1897 at Perth. Annie was described as a one year old daughter living at the family home of 145 High Street, Perth, in the 1881 census (GROS:387/32/12). Joseph also had a tragic early death. He worked in Perth as a journeyman dyer, but at the age of 24 he also died of phthisis pulmonalis, of which he had suffered two years (GROS: 1872/387/251). He died at 11.30am on June 17th 1872, at home at 10 Pomarium in Perth. His brother Gilbert informed the Perth registrar two days later. Also in 1700 Fenwick was also spelt Fennick, Finnick, and in 1600 Finick, Finwick; in 1500 Phynnick, Phinnick. Joan Woodroffe married William Paton on 4/11/1831. Son, William Hay Paton, married Janet Roger on 2/12/1859. Son, David Hepburn Paton, married Jessie McFarlane on 15/8/1889. Son, Charles Paton, married Jane Currie, on 28/9/1934. Son, Colin Paton, married Charlotte Harper Graham on 30/8/1969. Son, Christopher Mark Paton, married Claire Patricia Giles on 24/6/2000.